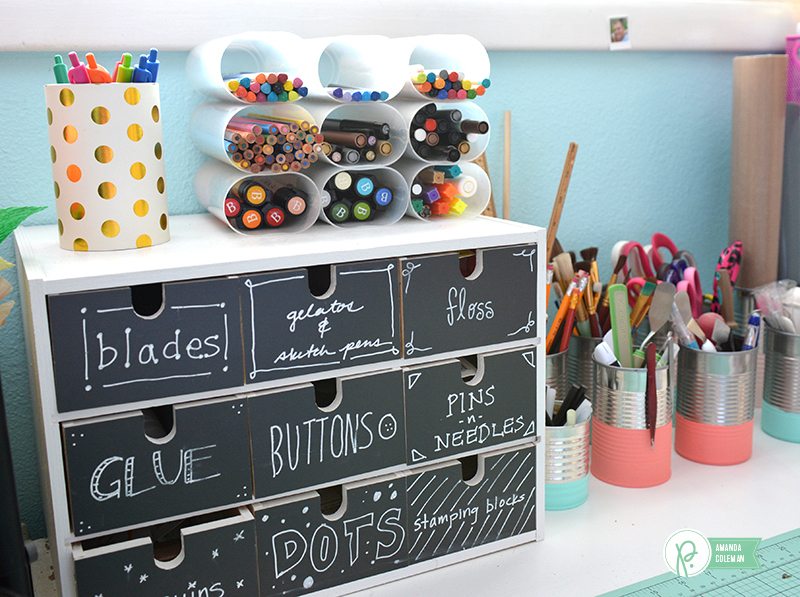 Upcycled Craft Room Organization - Pebbles, Inc. Happy New Year! Amanda here today. Like many of you, one of my goals in the new year is to de-clutter and become more organized, especially in my craft room. One of my go-to organizing techniques is upcycling everyday items to use as craft room storage and organization. With crafting comes a lot of little items–embellishments, tools, adhesives–that can get lost in the shuffle if not properly organized. 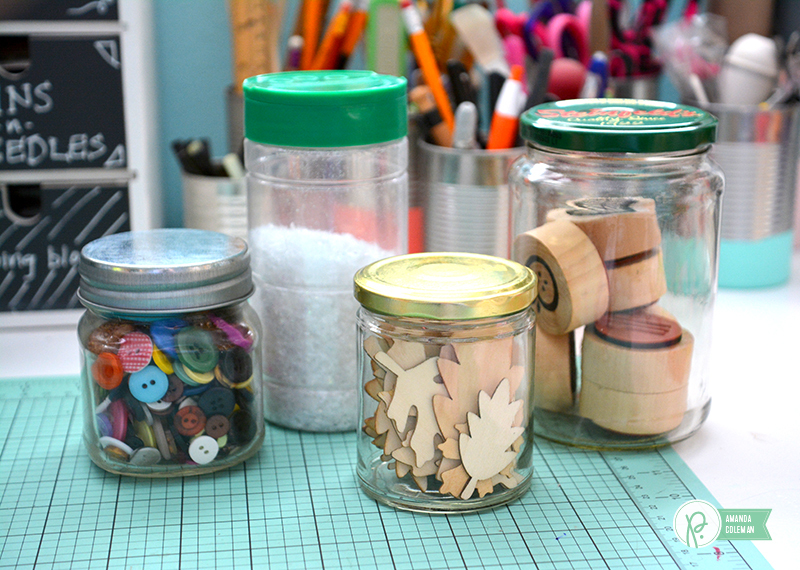 Upcycling common household items is an easy and inexpensive (practially free!) way to get a handle on the bits and bobbles that can overrun your craft space. 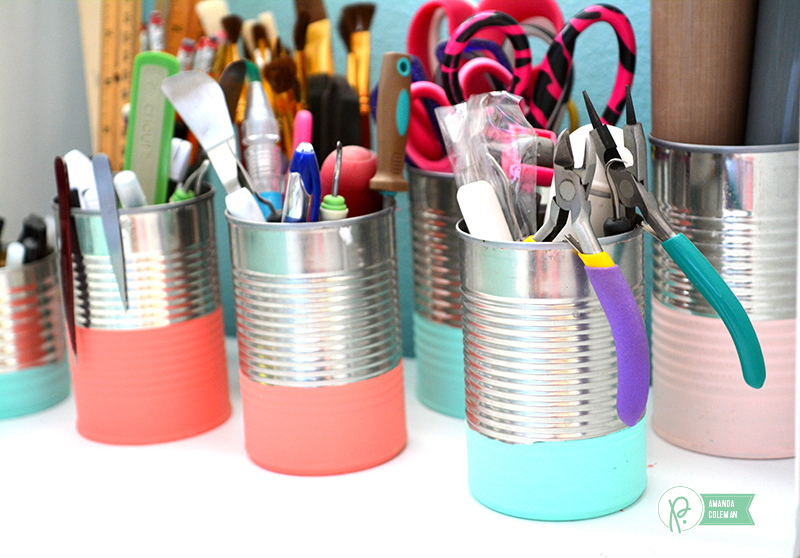 Although it is hiding in the upper left hand corner of this photograph, cans wrapped with patterned paper make the most perfect pencil cups (or home décor or gift containers). One of my favorite items to upcycle and use as storage containers on my desk are plain, ol’ soup cans. Cans of all sizes have a purpose in my craft room. I keep most of my small tools and supplies in paint dipped soup cans on back of my desk. Make your own paint dipped soup cans by wrapping a can with painters tape and adding two coats of acrylic paint. Plastic powdered drink containers are also a favorite of mine. 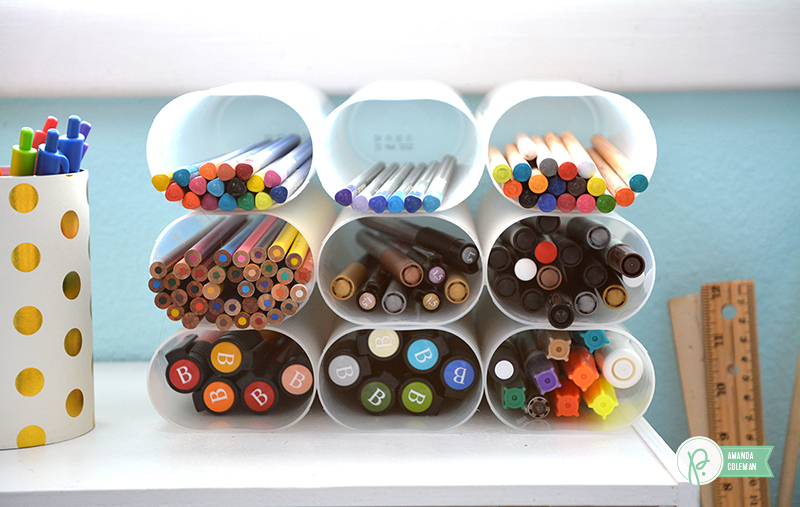 I glued several containers together to created a stacked pencil holder. Positioned on its side, this pencil holder allows me to easily see all of my writing utensils in their various colors. TIP: Use a liquid adhesive suitable for plastic when adhering the containers together. Empty jars are also a favorite of mine. They are great for storing collections of small embellishments like buttons, or for corralling collections of stamps or larger embellishments. TIP: Spray paint the lids for a cohesive look. Although this pegboard is not upcycled, it is the most handy organization piece I have in my craft room. To help maximize space, I hung a shelf on the bottom of my pegboard and use it to hold upcycled containers filled with pencils and straws. 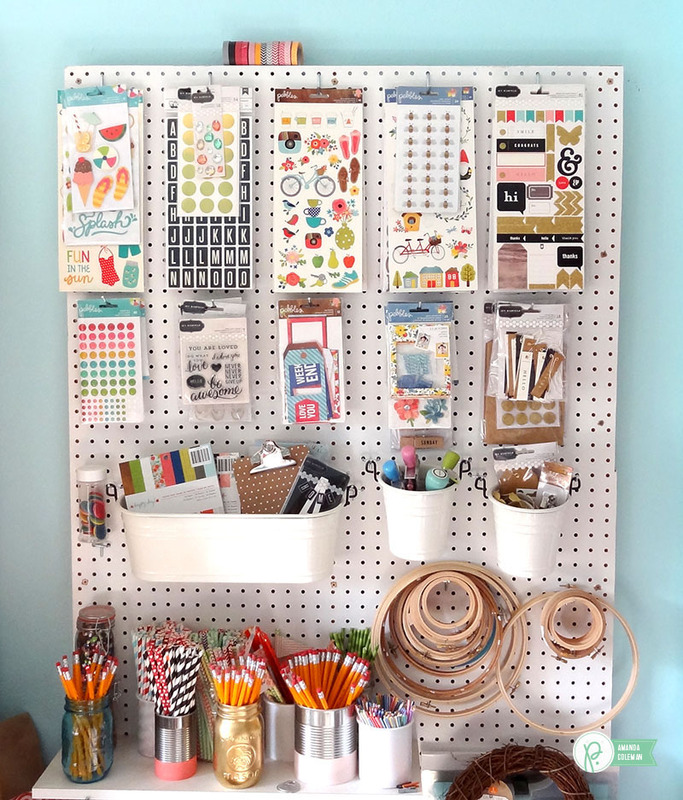 What are some of your tried and true craft room organizing techniques? Happy organized New Year to you! I’ve used the juice containers and a shoebox to make a fancy holder for all my alcohol pens. It’s a very pretty piece of décor on the desk as well as being functional. I just added feet to the box after I had covered it papers and more. Love your tips. just found your blog…and love the organizing ideas…got your site from an old Paper crafts magazine. Awesome! We’re so happy you stopped by!